I have taught for over 14 years, and I am not one of those teachers that hates students. As a matter of fact, I love my "kids." But here's the deal....There is a trend now that blames teachers when students fail. I don't want my students to fail. I do everything to avoid it. I provide my students with quality instruction. I get to know them--I develop relationships with them. I create lessons centered around their interests. I communicate with their parents. I take formative assessments and differentiate. I currently have a foreign exchange student from Kazakhstan who is baffled by the attitudes of many of our students. "In my country, if they acted like that in school, they would be sent to work," she recently told me. We have a new teacher evaluation system that centers around administrative observations, student assessment, and student evaluations of teachers. I was actually pleased with my scores at the end of the semester (I teach on block schedule). My students and administrators were benevolent in their evaluations. Most of my students were benevolent with their scores. Wait--what do I mean by "benevolent with their scores"? Well, I mean this. One of my students scored a 33 on her pre-assessment and a 36 on her post-assessment. When I asked her why she had made so little gain (because I had been with her in the classroom and knew she could do better) she explained that she just didn't feel like trying. She put down whatever. And why should she try? She is not held accountable--I am. 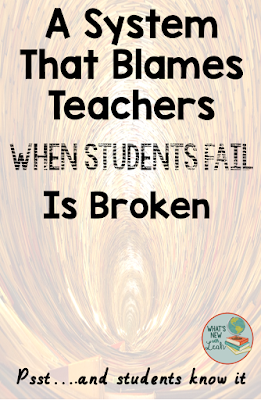 There is something inherently wrong with a system that blames a teacher when a student fails. Listen--the students are here to learn. It is ultimately their education, and we need to make sure that they are held responsible for it. Students need to develop a sense of self-worth. Not just "self esteem." Self worth comes from accomplishment--from achieving and helping your peers to achieve. From being a good citizen. Self-esteem comes from entitlement. You feel good about yourself just because you're you. A person with high self-esteem will be focused on what she can do for herself. A person with high self-worth will be focused on what she can do for others (her community). Keeping those definitions in mind, would you rather your neighbor have high self-worth or high self-esteem? (Dramatic Pause) I thought so. So why are we so focused on self-esteem? 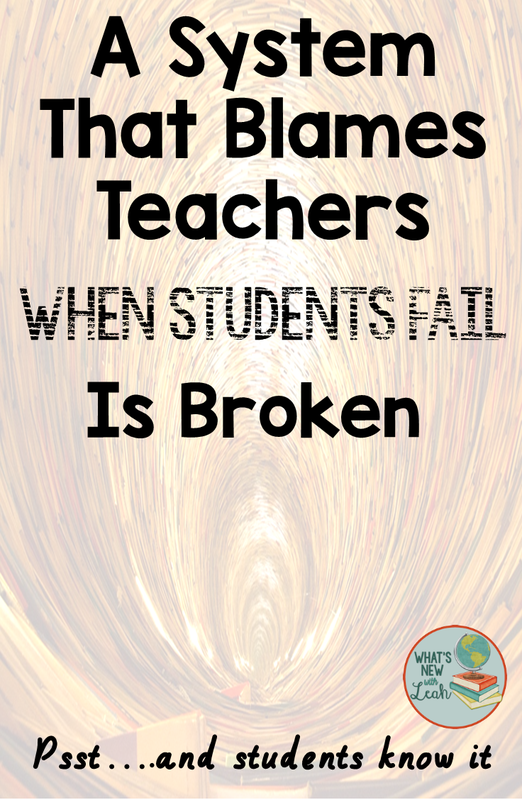 Why do we blame teachers when students fail? Students cannot develop self-worth by deflecting blame for their learning. "I didn't learn this because the teacher didn't do her job." It's a shame, but in many cases, what they mean is "I didn't learn this because the teacher didn't do it for me." Nope. Not acceptable. They must take ownership for their own education. They must for our country to remain competitive and for our students' futures to remain bright. So who will foment this fundamental change? Parents and teachers must. The politicians and the bureaucrats will not (a.k.a. the policy makers). I am the mother of a typical child. When his teachers email or call me about his bad behavior and slacking-off, my first impulse is to naturally be defensive. But then I take a step back and think about the person I want him to become. It's not someone who underachieves and blames everyone else for his problems. So I take a deep breath and take the teachers' side. And you know what? I tell my son that it's okay. He messed up, but he has a chance to make it right. If he tells me he's being picked on or has been wrongly accused, I tell him exactly what I tell my tenth graders after having a sub who has accused them of bad behavior that they swear they did not perpetrate. "Raise your hand if you've ever been punished for something you didn't do." "Raise your hand if you're still alive." We don't give our kids nearly enough credit.